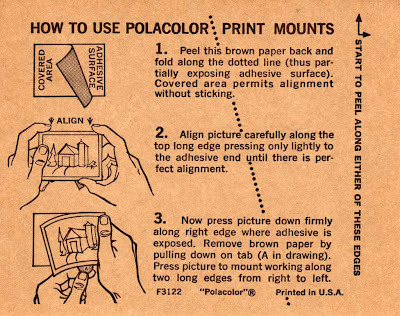 I was surprised to find this amongst the pieces from my Polaroid a manual to a Kodak Brownie Bullet. This manual is just as cool but in a "for kids" sorta way. Oh and I found a big pack of Polaroid mounts. I've got like 14 of these. Heres a scan of the directions on the back. I've got some more stuff like this. I'll see if I can get to scanning them sometime. I received, for Christmas, an old Polaroid Camera. The best part of this is that it came with a full manual. It's full of complex directions on how to use this "automatic" camera. Some of the instructions are general enough to still applicable to modern cameras. I love my camera collection. When I get back to school I'm going to do another photoshoot with them to catalog the whole set. I snapped some pictures with my digital camera while we were opening presents at my grampa's house. I'm not in any of these because I was the photographer. This keeps happening. It looks like I'm not at any of the events I'm at. I also shot some video with my camera. I did a quick mix in Premiere so you can see what I shot. It's not a brilliant edit, but it's for the family. So we just finished writing the script for the new movie Without Troy, that we'll be shooting in the spring. During one of the writing sessions I snapped a couple of pictures. I faux lomo'd the pictures because I was tooling around in Photoshop. They were pretty boring otherwise. You can see Jomay, Nic, Austin, and Emily. Emily isn't really on crew but she is a good script reader. Obviously Tom and I aren't pictured, but thats just because I had the camera and Tom is often ignored. I'll be posting more information about the movie soon. We have a website in the works that will have proper updates on production. Suffice it to say that Without Troy will be my biggest production yet. I got a new Holga Camera for Christmas! I immediately modded it to accept 35mm film and drove around taking pictures. I had a heck of a time getting them developed at CVS but here are the results. These are fairly normal amongst other Holga photos. Many uses cross processing techniques that I'll some other time to get high contrast and wild colors. Here you can see the odd focusing an vignetting causes by the plastic lens. I can't remember the last time I used a non-disposable film camera. I'm so entrenched in our digital world that this was inredibly refreshing for me. It takes a lot more effort but the results are so interesting that it is totally worth it. If you liked these photos you can learn more about lomography at the official lomography website. I'm hoping this won't be a Christmas break fluke, but I'm starting my own blog. I've posted on group blogs before but only intermittently. This one is mine to serve as a companion to my website (www.ewzzy.com) and so friends and family can keep up with me when I move to Los Angeles this summer. I'll be posting stories and photos and fun stuff I've encountered. I already have 3 photo posts lined up so I'm gonna get to work on them now.